You'll have to excuse the nostalgia nerd coming out right now. I've been gathering quite a few pics of the different school buildings in which we've been educated over the years. I'll be posting them a few at a time over the next week or so. 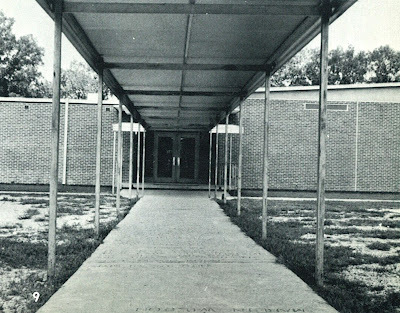 If you attended the Sheridan Middle School campus any length of time, then you know the Kelly-Williams Gym. 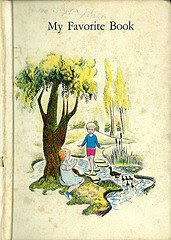 Most of us had P.E. in the gym and if you played basketball then you've spent a considerable amount of time on the court. It would be impossible to count the number of laps that were run around that wooden catwalk in front of those green metal lockers (Say, did Tim McCool really jump off the catwalk?). This place was a classic, unappreciated edifice filled with nostalgia. Remember seeing the movie, Hoosiers? Well, that's the Kelly-Williams Gym - exactly! Many of our parents sat in the same bleachers watching their Jackets play, they danced on the same hardwoods & stuffed their sweaty gym clothes in the same lockers. I'm just fascinated by this. Anyway, I digress. 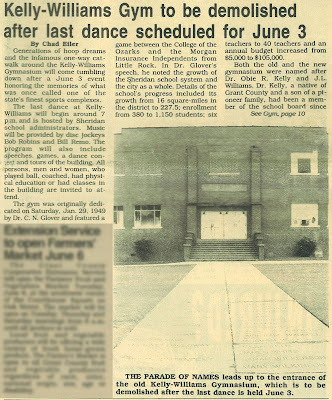 Below is the article announcing the final dance in the Kelly-Williams Gym on June 3rd, 1995 and the demolition to follow. You can click to enlarge the newprint, but I've bulleted a few interesting facts from the article, dated Wednesday, May 31st, 1995. 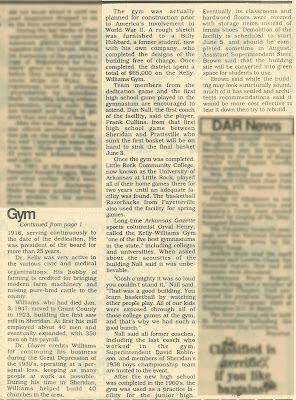 The gym was originally dedicated on Saturday, January 29, 1949. The gym cost the school district at total of $65,000 to complete. 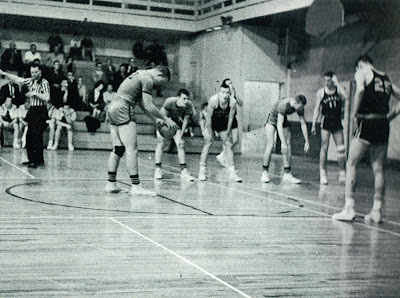 Frank Cullins was the high school player to sink the very first basket in the gym during a game between Sheridan and Prattsville in 1949. He was on hand June 3rd, 1995 to sink the very last shot. "Long-time Arkansas Gazette sports columnist Orval Henry, called the Kelly-Williams Gym 'one of the five best gymnasiums in the state,' including colleges and universities." 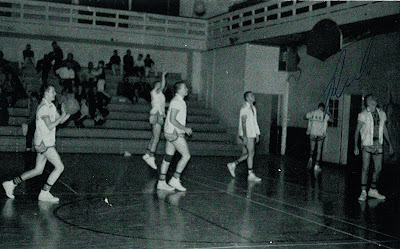 Above are two shots of basketball games in the mid-60's. You'll see in the background of the photos on the right side, the door that we all used. You would have to descend down a short set of wooden stairs to exit the gym, bringing you out on the sidewalk below, facing the middle school building. Thanks Melissa, that's interesting. 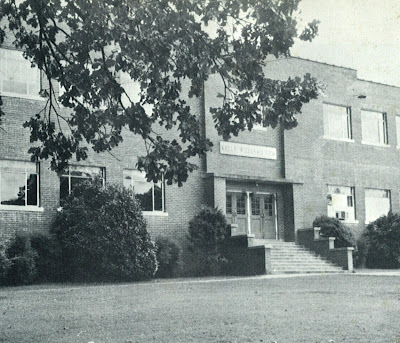 My papaw helped build one of the buildings on that campus... either the gym or the old agri building. Seems that he lost his watch sometime during the construction and believes it's somewhere in the foundation of the building.